So Lil P is back from her summer holidays and she wanted a homecoming party.. rather a birthday party to celebrate my birthday, my mom’s & my sister’s which she had missed. Since all of us were at one place after long, we decided to have a small party. Lil p wanted a rainbow cake with blue icing. She wanted to bake it herself.. aka mix, pour, watch it rise & then decorate. I did not want to mess it up so ordered the cake from Monika of the sinamon fame. Its so nice to have friends who bake 😉 She sent me this gorgeous gorgeous cake with blue icing & lots of sprinkles so that Lil P could do the decorations herself..
Notice the tongue? Lil P decorating the cake with full concentration. Blue icing to represent the sky .. While I was taking pics… Lil P did not have the patience to wait and we caught her slowly trying to pick one gems off the cake..
After a good laugh, we got down to eating it.. Lil p enjoyed cutting the cake and feeding it to everyone.. The smiles say it all .. Thank you Monika for making our day..
Lil p gave us these really cute handmade cards .. pics coming soon. Please post pics of ‘something white with co ours on it’ soon. Happy Birthday to your little one.. Such a pretty cake.. no wonder she has got such a huge smile.. wow! 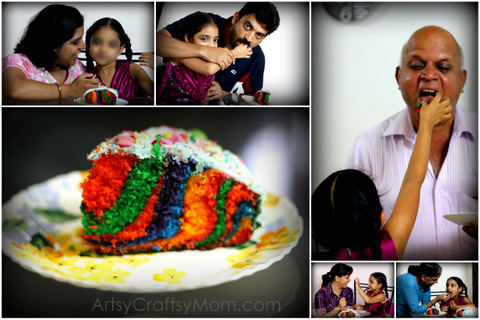 Love how colourful and happy the cake looks.. which clearly reflects on your little ones face..
yummy cake!!! Lil P did a gr8 job with decorations..
Shruti …Such a lovely cake ..good to see whole family bonding. shruti …Such lovely cake…Good to see whole family bonding.God bless.